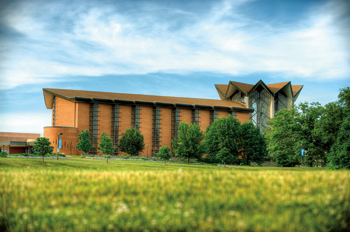 Valparaiso University’s Chapel of the Resurrection was designed and built during an important time of transition in church architecture. After the Second World War, many American and European Christians believed that the architecture of new churches was tremendously important, given the uncertain place of Christianity in the fragile postwar world. Edward Mills, a British architect, captured this uncertainty in the preface of his 1956 book The Modern Church. “The history of the last fifty years,” he wrote, “indicates the chaos that results when the world turns its back on Christian ideals. Scientific discovery and development have out-paced spiritual growth, and man is no longer able to control his own inventions. Our civilization is indeed at a crossroads… the total destruction of the human race is within the realms of possibility…” (15). This is pretty heavy stuff for the beginning of a book on church architecture! But Mills hastened to introduce the hope that Christianity brought, a message that could cause men to “live together as brothers.” This precarious situation declared “the need for new methods of presenting [the Gospel] to the world,” and contemporary architecture, he argued, needed to “play its part” in revitalizing the church. “If we do not build churches in keeping with the spirit of the age,” Mills cautioned, “we shall be admitting that religion no longer possesses the same vitality as our secular buildings” (15). Reformers urged that, both inside and out, new churches must offer a fresh solution to the needs of the day, a solution that should grow organically out of contemporary life and culture. A variety of national organizations promoted the adoption of a new kind of church architecture. Of particular note were two committees of the National Council of Churches (NCC): the Commission on Architecture and the Bureau of Church Architecture (the first more theoretical, the latter more practical). Members of these NCC committees were largely church leaders, although important architects participated in their discussions. Among church architects themselves, two important national bodies were the Church Architecture Group of the American Institute of Architects (AIA) and the Church Architecture Guild. The NCC committees and the Guild co-sponsored an annual Conference on Church Architecture as well as international conferences and study tours. This wasn’t self evident to postwar Americans. Rev. Bill Canaday, of the Park Avenue Congregational Church in Arlington, Massachusetts, informed the film’s producers that he had booked A Place to Worship but wanted the lowdown before showing it to his congregation. “I am wondering whether I should have previewed it first,” he mused. “What I want to know is whether the examples shown in the picture are ‘good’ contemporary design, giving a fair picture of what we might expect if we went into contemporary. Of course in New England Congregationalism, it would have to be a ‘conservative’ contemporary, and I am also wondering whether the film would shock them out of their wits” (Rev. Bill Canaday to Marvin Halverson, 12 November 1958). What made a church modern? “Modern” generally meant a rejection of historical styles, but it was more than an erasure of the past. The choice of materials was critical, and because of an emphasis on “truth” in architecture, visible structure and natural finishes were common. Architects used modern industrial materials, like steel, concrete, and laminated wood beams, boldly employing their physical attributes and celebrating their cheapness and efficiency. Church designers also recognized the importance of symbols, but insisted that those symbols be fresh, meaningful, and spare, not the excessive or irrelevant ornament of bygone times. Critics used terms like “honesty,” “authenticity,” and “simplicity” in their pleas for a new church architecture. In short, reformers envisioned the best new churches as buildings that were truly of their own times, of contemporary materials in contemporary forms. The first attempts at modern church architecture were scattered and not widely influential. In the United States, we might begin with Frank Lloyd Wright’s Unitarian-Universalist Temple, in Oak Park, Illinois, completed in 1908. Although idiosyncratic, this church was path breaking in its use of steel-reinforced concrete, a common characteristic of later modern churches. In Europe, August Perret’s lacey Catholic Church of Notre Dame in Le Raincy, from the 1920s, showed the potential of reinforced concrete—great volume with strength and lightness allowed for tremendous stained glass windows. A 1928 Lutheran church by Otto Bartning, the leading Protestant architect in Germany at the time, achieved a similar effect of light and volume using structural steel. Another important early European example is Corpus Christi, Aachen, 1930, designed by Rudolf Schwarz, a highly influential architect and theorist both before and after the war. In Schwarz’s work we have not just the use of modern materials, but a different way of thinking about space and the movement of people within it—plain, unornamented walls, simple geometry, a stark contrast of black and white surfaces, and a luminous interior. After the Second World War, the modern church architecture movement in Europe rapidly gained ground, largely because of the need to replace worship spaces destroyed by war. These new churches responded to liturgical renewal as well as modernism in architecture. Well before Vatican II, Catholics and Protestants were moving toward an architecture that would support greater congregational participation, rejecting historicism and hierarchical forms (most notably, the divided chancel). American architects and theologians looked to the new churches of Europe for inspiration. The two men who most influenced the Chapel of the Resurrection’s design were architect Charles Stade and A. R. Kretzmann, president O. P. Kretzmann’s brother and pastor of St. Luke Lutheran Church in Chicago, who was passionately interested in church art and architecture and served as liturgical consultant for this project and many others. 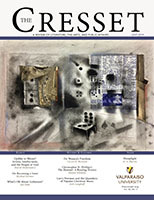 Stade and Kretzmann traveled abroad extensively to view architecture and art, and they avidly read journals and international publications covering this new architecture. In America, too, church building accelerated dramatically after the war, fueled by the need to keep up with population explosion in new suburbs. Through the 1950s, however, most new churches were not modern but “modern Colonial” brick buildings with white pillars, or even a persistent Gothic style, for instance the enormous new building Mt. Olivet Lutheran constructed in Minneapolis in 1949. In parish church architecture, however, by the late 1950s, modern was winning, especially in the rapidly growing suburbs of the Midwest and West. Charles Stade, the architect of the Valparaiso University chapel and several other buildings on campus, including the former Moellering Library (1957) and Linwood House (1959), was a young man in the 1950s. Yet he already had designed many churches, particularly for the LCMS. Raised in Des Plaines, Illinois, he attended a Lutheran preparatory school in Milwaukee, the University of Illinois, and finally Princeton, where he earned his MA from the architecture school in 1948. At Princeton, Stade worked with Jean Labatut, a studio instructor and planner who became Stade’s dear friend, advised on the chapel project and through this connection became the official consultant for Valparaiso’s east campus expansion. Stade’s brother Robert was a pastor, as were most of the friends of Stade’s youth. When they were faced with building projects, Stade was the architect who came to mind. Stade was a thorough modernist—his own home was a shrine to Scandinavian modern design, down to the Dansk china and the surfeit of aqua—but he was not without a critical appreciation of the architecture of the past, and in fact during his time at Princeton, he had spent the better part of a year on a fellowship to study the great churches of Europe, old and new (Barlow, 3 June 2006; “Modern Church Architecture Defended…” 1956). Stade came back to Chicago after he graduated from Princeton and worked first for a large Chicago firm before setting up his own Chicago practice in 1951. In 1955 he moved his practice to Park Ridge, where it remained until closing in 1981. Over the course of Stade’s career, he designed hundreds of parish churches. He was precise, restless, cosmopolitan, and well-versed in the Lutheran tradition. Stade joined the Church Architecture Guild in 1962 and was president and later a fellow of the American Society for Church Architecture, a new organization founded in Chicago in 1959. Stade was not a major national player but was devoted to the modern church movement, attending conferences and building exclusively modern buildings. The Valparaiso chapel was his most significant commission, and, according to his daughter, he felt it was his greatest work. Conversations with the university began in the fall of 1955, when Stade was just thirty-two, and he and his associates worked on the initial plans for nearly a year (Johnson, 22 March 2009). Jean Labatut also assisted with the design. After one meeting in 1956, Stade wrote to his mentor: “It was certainly beyond and above the call of duty to stay up half the night to work on the chapel” (Stade, 10 April 1956). By the mid 1950s, there were some excellent modern churches in the United States. In 1958, the Commission on Architecture of the NCC released a list of eighteen “Outstanding New Churches” erected in the previous twenty-five years, determined by polling noted architects and church workers nationwide. Not all of the buildings on the list were monumental; several were noted for their economical use of materials (such as the Community Church in San Lorenzo, California, made from a Quonsut Hut from nearby Camp Parks). Chicago modernist Paul Schweikher’s 1951 Methodist church in Plainfield, Iowa was noted for economy, flexibility, and good design. Many listed, however, were more monumental structures by well-known architects. There were three churches by Pietro Belluschi, a founder of the Northwest style of architecture who designed some lovely churches in the Northwest, including Central Lutheran in Portland. Two Midwestern buildings on this list are of particular significance when thinking about the Valparaiso chapel. 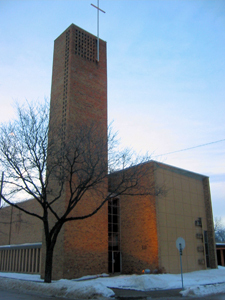 The first was Eliel Saarinen’s Christ Church Lutheran in Minneapolis. Saarinen, a Finnish immigrant and son of a Lutheran clergyman, designed Christ Lutheran at the request of its young pastor, William Buege, who took the helm in 1946 (and became Dean of the Chapel of the Resurrection in 1964). This established, middle-class, Missouri Synod congregation had been attempting to build a new church since before the Second World War. Buege advocated the modern style, both because of his progressive outlook and his sense that only modern would be affordable. He had the gumption to pitch this small parish project to Saarinen, challenging him to design a spiritually satisfying, inexpensive, modern church for small, suburban congregation. Surprisingly, the world-famous and very busy architect agreed to take on the project. Critics loved and still love this intimate space, its unadorned simplicity, sensitive and dramatic lighting, perfect acoustics, soft colors, and warm, clean surfaces. Christ Lutheran is the best of a common type of postwar church: a long rectangular, high ceilinged, processional nave with a slightly raised chancel at one end, a flat or nearly flat roof, and a free standing or attached tower near the entrance. Saarinen himself had designed a very similar, larger church for Tabernacle Church of Christ in Columbus, Indiana in 1942. This is the basic form of Schwarz’s Corpus Christi in Aachen, and many other European churches well into the 1950s. This was not a design that Stade preferred for parish churches, but I think its influence over the Chapel of the Resurrection is clear in the design of the nave and campanile. The second building that I believe influenced Stade was Frank Lloyd Wright’s 1947 meetinghouse for a Unitarian congregation in Madison, Wisconsin. Wright famously said of this building that “the whole edifice is in the attitude of prayer,” its triangular roof soaring upwards at the pulpit end. The warmth of clear light and natural textures (wood, ceramic, hand-woven cloth) appealed to architectural critics, as did its formal integrity. Stade was a great admirer of Wright—his daughter said that one day her father saw Wright at the Guggenheim Museum in New York City and he talked about that chance meeting for years afterwards (Barlow, 3 June 2006). 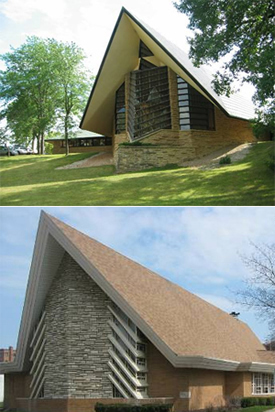 Stade’s church for his parents’ congregation, Immanuel Lutheran in Des Plaines, Illinois (1954), demonstrates obvious similarities to Wright’s meetinghouse in the triangular roofline of the chancel end of the building, the use of bright, clear light, and details such as built-in brick planters, and patterned geometric window panes (also features of the Valparaiso chapel). Stade designed dozens, if not hundreds, of similar churches in the 1950s and early 1960s. A university chapel was a different sort of commission for Stade, one of remarkable size and institutional importance. Young as he was, Stade, by this time, was the de facto architect for the LCMS and a natural choice for the project. Stade and A. R. Kretzmann traveled around looking at eighty or so examples of new chapel architecture in Germany, England, and the US. They would have seen a mix of things. Campuses across America expanded rapidly in the postwar years to accommodate growing numbers of students. Although campus architecture until this point tended to be conservative Georgian or collegiate Gothic, times were changing. Adventurous work, while not without critics, earned a great deal of praise, and several new university chapels won national attention. In Chicago, Mies van der Rohe’s chapel at IIT (1952) was a strong expression of the International Style—rectilinear, steel frame with a precast concrete roof on brick walls. Another notable chapel of the period was Eliel Saarinen’s round structure at MIT (1955). By the late 1950s, Bauhaus architect Marcel Breuer was working on his designs for the large abbey church at St. John’s College in Minnesota, a modernist landmark still, and it was surely on Stade’s radar. 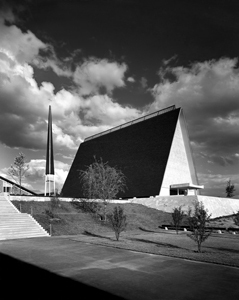 And, although it would take some time before the building project was finally complete, the controversy surrounding Walter Netsch’s designs for the Air Force Academy chapel was underway. Netsch submitted the design to Congress in 1955, where it met with the same sort of suspicion that other liberal- looking projects of the day encountered, as well as reasonable concerns about its architectural value; James Hudnut of the Harvard School of Architecture dismissed it as “Gothic Revival in sheet metal” (Minutes of NCC Committee on Architecture Meeting, 1 April 1960). One of the most noted new college campuses of this period, erected just about the same time as our chapel, was the work of Eliel Saarinen’s son Eero, Concordia Senior College in Fort Wayne. In designing this campus, Saarinen drew inspiration from a drawing of an early North German village. The chapel, with its steeply pitched roof, and interior reminiscent of his father’s Christ Lutheran in Minneapolis, bears a significant resemblance to the hundreds of A-frame parish churches Stade designed over his career. Lutherans as a whole were leaders in the modern church architecture movement. A pan-Lutheran group founded the Lutheran Society for Worship, Music, and the Arts in Chicago in 1957. This progressivism came as something of a surprise to outsiders. The artist Albert Christ-Janer, writing in 1962, suggested that “one would expect this Church, so orthodox in theology and so conscious of its Old-World origins, to cling more tenaciously than any other to traditional forms in architecture. 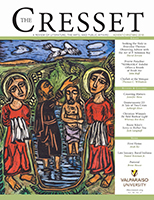 Instead, Lutheran congregations have led the way in the contemporary approach to religious design, often electrifying conservative communities with their modern churches.” “In tradition bound America,” he wrote, “the modernism of the Lutherans comes as something of a shock” (Christ-Janer and Foley, 127). Theodore Gill, writing for Christian Century in February of 1958, enthusiastically praised the new construction at Valparaiso. Gill found the chapel, then under construction, to be excellent in design, detail, and workmanship. The new union, completed in 1955, he deemed “Finnish as a sauna,” high praise indeed! Gill thumbed his nose at only one new building on campus, the dormitory for the deaconesses (Huegli Hall), which he called “embarrassingly ‘contemporary’” (Gill 221–3). Valparaiso’s decision to build a chapel in the modern style was a choice of practicality as well as taste. As Stade himself noted, modern was far cheaper to build than neo-Gothic, which would have been completely beyond this university’s means, particularly for a structure this size (“Modern Church Construction Defended…”). And the chapel was not, like the small structures at MIT or IIT, primarily an intimate space for meditation, but a space intended to accommodate an assembly of the entire community everyday. Much of the design of the building, such as the size of the altar rail and the number of exterior doors, demonstrates the need to move people through quickly. Two other churches are commonly cited in relation to our chapel: the Church of the Nativity in Bethlehem and Basil Spence’s new Coventry Cathedral in England. In the Cresset of May 1957, A. R. Kretzmann claimed that the Church of the Nativity in Bethlehem was the inspiration for the overall form of the chapel, in particular the raised, circular chancel. This church was probably built by Constantine in the early fourth century. 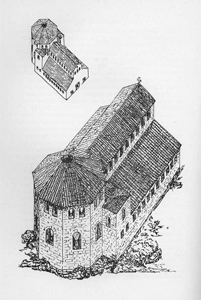 It was destroyed and rebuilt in the sixth century, and what we know about the original building now is largely based on archaeological studies. Although not all A. R.’s information about this early church was accurate, the Church of the Nativity did have a long nave and a raised, circular element at one end (Hamilton 1947 was his principle source in The Cresset article). So there could be reason to believe that our chapel was inspired by this source, particularly since A. R., in print, claimed that it was. I took this alleged historical inspiration at face value until I looked back at my notes from a conversation with Martin Marty in 2006. Marty knew Stade well (Stade designed a church for Marty’s first parish in Elk Grove Village) and visited Valparaiso during the chapel’s construction. My cryptic note from Marty regarding the Church of the Nativity connection was: “A. R. made this up to get O. P. out of trouble” (Marty, 23 June 2006). Marty recently confirmed that indeed A. R. told him this when they (along with Ted Gill who was preparing his Christianity Today article) visited Valparaiso in late 1957 or early 1958 to view the chapel under construction (Marty, 18 September 2009). Apparently, the chancel design was originally the product of the need to move a couple thousand students through the Lord’s Table in fifteen minutes, not a response to any historical model. Although Stade, A. R., O. P., and the architecture committee liked the design, “they were taking flak because no one had ever seen anything like it” (Marty, 18 September 2009). In response to this skepticism, A. R. went home, looked in his extensive liturgy-architecture-arts file, and found the Bethlehem Chapel. A. R. and O. P. were pleased with this historical precedent, and that is how the story started. The important thing here isn’t the order of historical influence as much as the fact that, despite the modern design, historical precedent still mattered to many people. O. P. and A. R. both had a strong sense of liturgy and Christian history. As did Jean Labatut, who wrote to “Dr. Kretzmann” in September of 1956, regarding the altar, “that excellent composition you suggested to Charles Stade reminded me of my last visits to St. Sernin” in Toulouse, France, and Labatut forwarded a postcard picture of a late eleventh century marble altar (Labatut, 14 September 1956). A. R. had the kind of mind that ranged all over the place, making connections and drawing references. He was intently interested in symbolism, and he looked backward throughout Christian tradition for meaningful forms and icons. This might seem on the surface to clash with modernist preference for organic architecture and disdain for historical models, but many architects and theologians didn’t see it this way. Looking back to the origins of the Christian church for first practices was quite common at this time—it was the intervening historical styles that were problematic. And the Chapel of the Resurrection is, at least in terms of the large processional nave and separate, raised chancel, an ancient form. The second building often mentioned in connection with our chapel is Basil Spence’s Coventry Cathedral in England, built to incorporate, poignantly, the ruins of the medieval parish church of St. Michael, bombed in 1940. This comparison is indeed striking, particularly the monumental size of the buildings, the zigzag in the nave wall, and the similarities between our star-shaped chancel and the star-shaped “Chapel of Unity” at Coventry. Although this cathedral was not completed until 1962, Spence won the design competition in 1951, and his designs circulated widely. 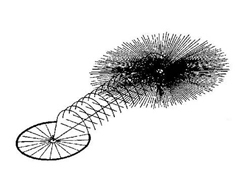 I am certain that Stade and Kretzmann were aware of these designs, although the parallels are far from exact. Stade does something different, for instance, with the nave windows. Rather than a flat window panel connecting the piers, Stade’s windows are L-shaped in cross section. This was a favorite technique of Frank Lloyd Wright, who liked to make corners disappear. One of the most striking aspects of Valpar-aiso University’s chapel is the contrast between the silo-like baptistery, the long, processional nave, and the high, star-shaped chancel. On the one hand, this demonstrates the multiple functions of this space—for both assembly and worship. It is also, a modernist would argue, not very modern. I think this assemblage of spaces is important for what it conveys about faith and history in this particular community. So, finally, as a means of understanding this building, I want to turn to the writings of the German architect Rudolf Schwarz and think about this form of worship space. In 1938 Schwarz published a thoughtful and influential book Vom Bau der Kirche (The Church Incarnate), translated into English in 1958. Schwarz set out a typology of church plans (based on the organization of people within worship space, relative to the altar). He contrasted the circle, in which people gather around a center (Ringkirche, inwardness), with the rectangle, in which the congregation processes forward, facing the front but not each other (Wegkirche, the journey). This was not, at least in Schwarz’s buildings, a strict dichotomy. A single Schwarz church, as Richard Kieckhefer argues, could suggest processional movement, community, and contemplation all at once (256). According to Schwarz, worship spaces must invoke both “lastingness” (stored up history) and process. His most spectacular design was the fanciful “cathedral of all times,” a schematic showing a quiet, circular space joined by a processional tunnel to a burst of light. This form, according to Schwarz, contained within it the whole of Christian history in the fullness of time. 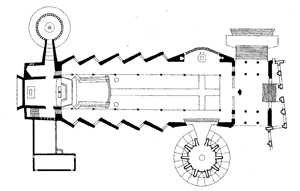 It was not, according to Schwarz, a plan that human beings could actually build—not an expression of facts but of deep knowledge at the bottom of things. The beauty and power of the “cathedral of all times” idea is intriguing, and we might use it to think about the Chapel of the Resurrection in these terms: a circular baptistery where a bond of community is formed; a processional nave, where members of the community join in assembly and in a forward, purposeful march; an ascent to a sparkling chancel, a joyful, light-filled space where a large circle of people face each other in communion. The people of God then descend back down to the relative darkness of the nave, seeing the newly visible light from the side windows facing them upon their return. I believe applying Schwarz in this way can help us understand the Chapel of the Resurrection, the work that it does in its community of faith, and why it has, for fifty years, done that work so well. I will close with a quote from Charles Stade, as he was finishing the plans for the chapel and surely thinking about cathedrals: “We hope the next generation will be able to say ‘they built as well and truly as the cathedral creators of the past did in their day…’ If the next generation can say that about us, then today’s architecture has succeeded” (“Modern Church Construction Defended…”). Gretchen Buggeln is the Phyllis & Richard Duesenberg Chair in Christianity and the Arts and Associate Professor of Humanities and Art History in Christ College at Valparaiso University. Author’s Note: This essay was originally presented as a lecture to the Christ College Symposium on 24 September 2009. I would like to thank Jesse and Ramsey Stade Barlow for their conversation and the generous gift of architectural books from architect Charles Stade’s personal library. Also thanks to Martin Marty, who shared his memories of the chapel construction project and has been wonderfully helpful with my research on postwar churches. “A Place to Worship,” typescript, 1958. National Council of Churches (NCC) Records, Group 6, Box 53, Folder 17. Barlow, Ramsey. Interview with author. State College, Pennsylvania, June 3, 2006. Canaday, Rev. Bill. Letter to Marvin Halverson, 12 November 1958. NCC records, Group 6, Box 53, Folder 17. Christ-Janer, Albert and Mary Mix Foley. Modern Church Architecture: A Guide to the Form and Spirit of 20th Century Religious Buildings. New York: McGraw-Hill, 1962. Gill, Theodore. 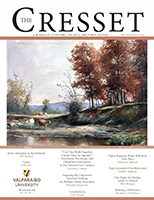 “Missouri Boom in Indiana,” Christian Century 65, no. 8, 19 February 1958, pp. 221–3. Hamilton, R. W. Church of the Nativity, Bethlehem: A Guide. Jerusalem: Government of Palestine, Department of Antiquities, 1947. Johnson, Charles. Email to author. 22 March 2009. Kieckhefer, Richard. Theology in Stone: Church Architecture from Byzantium to Berkeley. New York: Oxford University Press, 2003. Kretzmann, A. R. “The Church of the Nativity, Bethlehem,” The Cresset, May 1957. Marty, Martin. Interview with author. 23 June 2006. Marty, Martin. Email to author. 18 September 2009. Mills, Edward D. The Modern Church. New York: Praeger, 1956. Minutes from National Council of Churches Committee on Architecture Meeting, 1 April 1960. NCC Records, Group 6, Box 55, Folder 11. “Modern Church Construction Defended by Young Architect from Park Ridge,” Chicago Daily Tribune, 12 July 1956, p. A4. Schwarz, Rudolf. The Church Incarnate. Cynthia Harris, trans. Chicago: Regnery, 1958 . Stade, Charles. Letter to Jean Labatut, 10 April 1956. Jean Labatut Papers, Princeton University Library, Box 23 Folder 12.